I’ve always loved Japan. It just seems like everything is so beautiful: the grandiose architecture, the magnificent art, the rich culture, everything. Sometimes, though, it’s the simplest things that are the most beautiful. Complexity has it’s place, but often beauty is found in the smallest places. For instance, the lotus flower. An opulent beauty in such a small package; it’s rich colors that draw the gaze of every passerby. This simplicity is beauty itself. Just like the flower, the game is a beautiful experience. Just a glance at the cover would draw anyone’s attention. Lotus, from designers Jordan and Mandy Goddard, is a wonderful experience all around. From that first glance, to the final play, every player will be content in their experience. Renegade Games seems to have found a gem with this one. 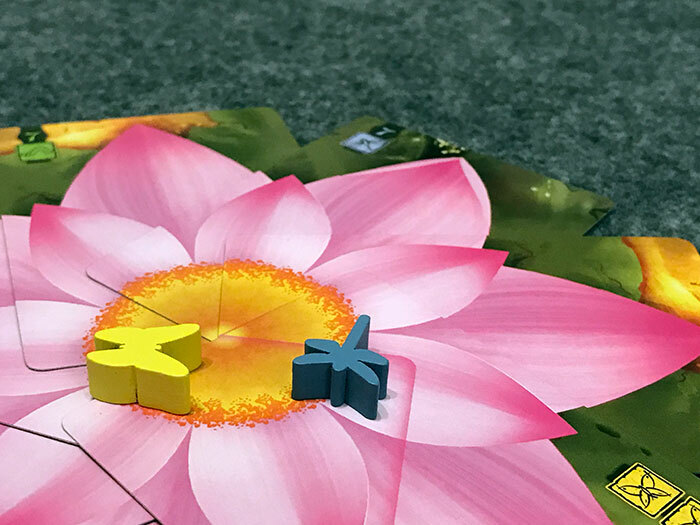 Like a flower, Lotus starts with little, but blossoms throughout the course of the game. The goal of Lotus is to be the player with the most victory points when a player runs out of cards in their deck. Each player will take two actions during their turn in hopes of gaining these points. Points are earned either through completing flowers or having control of them when they are completed. I’ll break that down more in a minute, but first, let’s take a look at what each turn looks like. 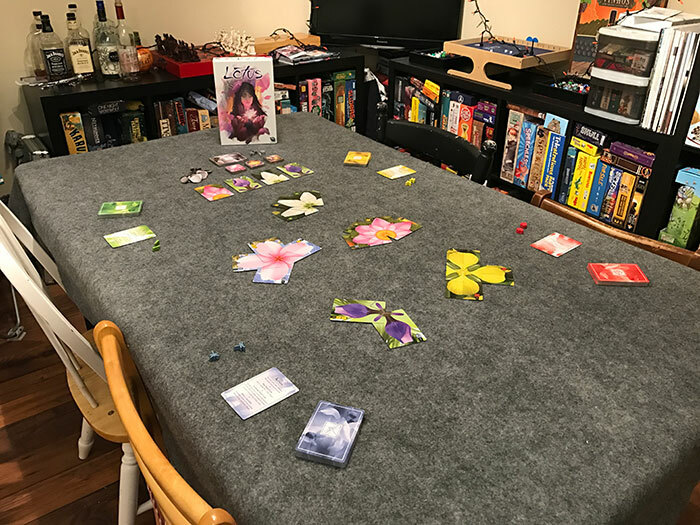 Play Petal Cards – Play up to two of the same flower’s petal card on an existing flower of that kind or start a new flower of that kind if one does not already exist. Exchange Petal Cards – Take up to two cards from your hand and place them on the bottom of your deck. Draw the same amount back from the top of your deck. 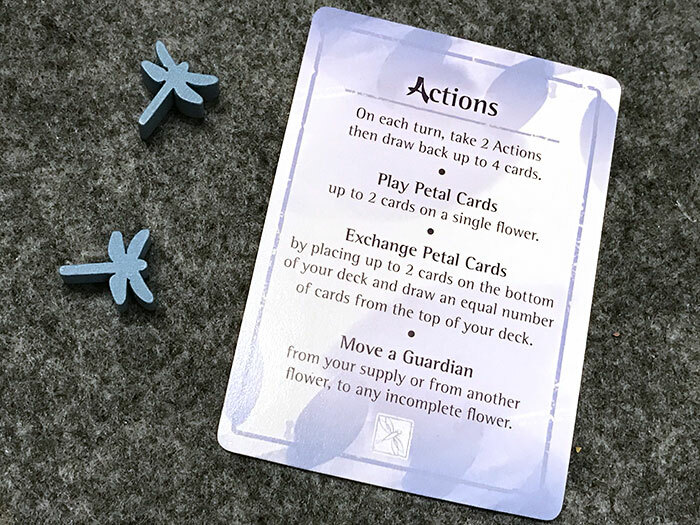 Move a Guardian – Move any one of your guardian tokens (either from your personal supply or from another flower) to any flower currently in play. Once a player has taken their actions, they draw back up to four cards (either from their personal deck or from the general supply) and end their turn. Each player continues to take turns in clockwise order until someone can no longer draw from their deck. When this happens, each player gets a final turn and then tallies up their points. So how do you actually get points? Points are earned when players complete flowers. Each flower has a certain number of petals that complete it. The cards actually fit within outlines of other cards to make a spiral of cards which visually completes the flower as well. The beautiful art makes playing these cards very natural and intuitive since they “fit” together. 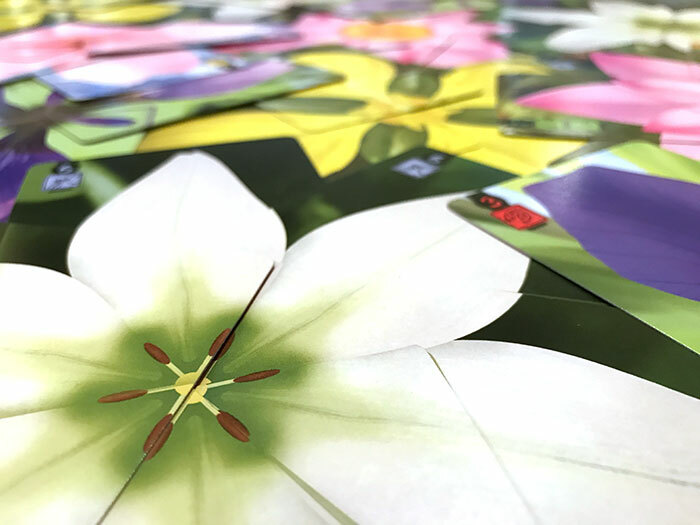 Once a flower is completed (either 3, 4, 5, 6, or 7 cards depending on the flower) the player that completed the flower keeps all of its petal cards. Each card is worth one point at the end of the game, so completing a set of seven can be worth a lot of points! The player who controls the flower will also gain either some points or a special bonus. Flowers are controlled by the player with the most of their symbols and guardians present. 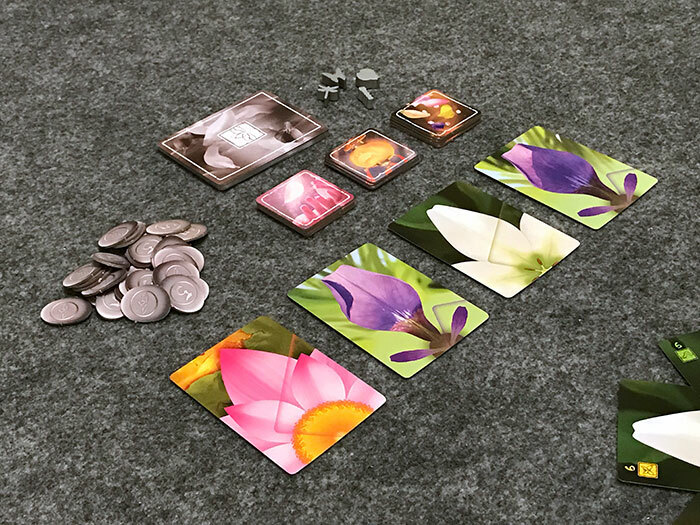 Most cards will have just one of the players symbols on them, but each player will have a single card for each flower that has two symbols instead of one. You’ll want to use these carefully, as they can quickly change who has control of a flower! (keep in mind that the cards from the general pool do not have symbols and do not count towards your total control!) Each player adds up their symbols on the cards and then adds one point for each of their guardian tokens on the flower. 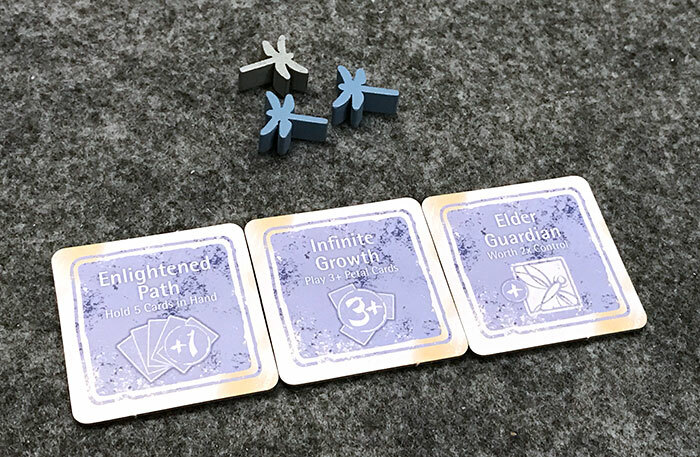 The player with the most symbols and guardians can either take a five victory point chip or a bonus tile (In the event of a tie, both players get the bonus of their choice). These bonus tiles are extremely important and can change the game drastically for any given player. The Elder Guardian tile allows you to take your silver “Elder Guardian” and add it to your pool. This guardian counts as two points instead of one when determining control of a flower. The Enlightened Path tile allows you to hold up to five cards in your hand instead of the normal four. This means that at the end of your turn you are able to draw an extra card. 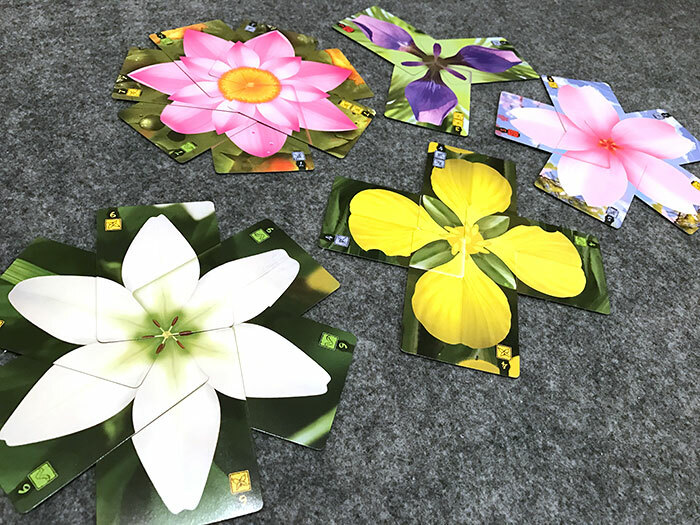 The Infinite Growth tile allows you to play three or more of the same petal cards on a flower at a time. It’s hard to know what is better between the victory points and the special power tiles, but either one can make a big difference for your in the end! Like I said before, this game has a simple beauty that really makes it shine. It is both relaxing and yet also exciting. There is something about laying down cards to make beautiful flowers in a lotus pond that puts me at ease. Of course, there is still strategy to be had here. In a way, Lotus provides a “push your luck” mechanic of sorts. When you play cards, it is unlikely that you will be able to play a complete set in one turn. This means that you will have to start a set and hope that no one else can complete it before your turn comes around. At the very least, you must hope that no other player will take control of it from you before completing the flower. There are times in this game where you will spend your entire turn exhausting your hand for one flower only to have control of that flower taken away from you as another player completes it. While this can be frustrating, it causes you to really think about whether or not laying down those cards is worth it. On the flipside, not playing cards in hopes of keeping your small victory will waste your turn, keeping you from any points. Another interesting part of Lotus is its ability to make you think about the relative gain for all players in a given scenario. For example, if you are able to complete a flower that has four cards (thus is worth four points to you), but you will not be able to take the bonus for controlling it, are those four points worth giving your opponent a five chip or a special power? In contrast, if you are completing a seven point flower, those seven points will probably be more valuable than your opponent’s bonus tile and will definitely be more valuable than the five points they could get. While the extremes are easier to decide, it’s the flowers that are in the middle of the points spectrum that really present interesting and challenging decisions. 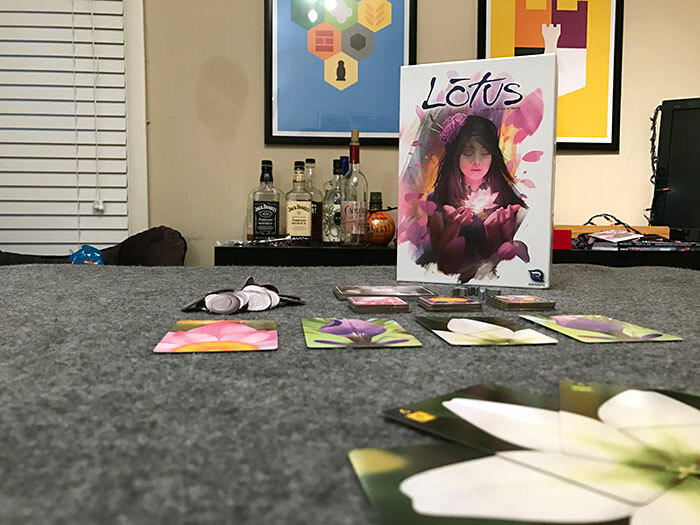 Lotus is an extremely unique game that balances both its beauty and gameplay along with its depth and ease of entry. You can break this game out in front of people who have never played a modern tabletop game and they will be astonished by its beauty, yet you can also play this with grizzled gaming veterans and they can still find strategy in it’s tough decisions. At the end of the day, everyone will be happy when they finish a game. Whether you win or lose, there’s something about building this beautiful lotus garden that is both satisfying and calming. I know that i’ll keep bringing Lotus to the table if not just to wow my friends with it’s unique and beautiful flower building mechanic. I really can’t overstate how amazing this game looks, spread out on a table. 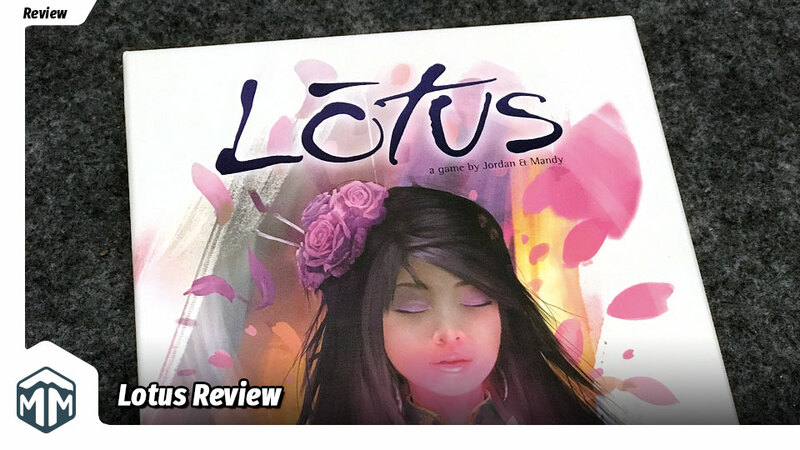 If you want to find a great game to get non-gamers interested in the hobby, Lotus does the job exquisitely. I wholeheartedly recommend that you go pick this one up! What do you think about Lotus? Give us your opinions about what you like and/or dislike about the game in the comments below!